I think long-time readers of my blog will agree that I’m not usually one to court controversy. Mostly this blog is filled with my hobby projects, news about my writing, a bit about travel, and the occasional ‘thought piece’. Yesterday’s blog post, Is Wargaming Getting Too Easy, started off as one of the later. Only after I had written it, did I realize that I had given it a slightly ‘provocative’ title (well, in wargamer terms anyway). Once I realized that, I admit, I decided to run a little experiment. I wondered if I could get the piece to go viral. So, I put up links to it on a number of forums and Facebook groups of which I am a member. The effect was nearly instantaneous. Comments started flooding back. In only a few hours there was so much discussion going on in different places that I could no longer keep up with it. Overnight, the blog has become my 7th most viewed blog-post of all time (with about 5,000 views, so we still aren’t exactly talking a global scale here). There has been a lot of interesting discussion, most of it civil, though there were a few calls of ‘elitism’. In a few places I joined in the discussion, and at one point even updated the original post (to include the final paragraph). It was all kind of fun and exciting, briefly. This morning though, I felt differently. 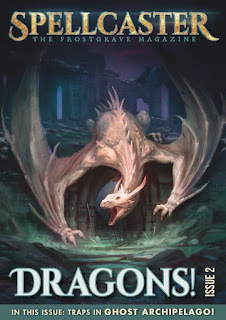 As I sat down to do my morning writing (the deadline for Ghost Archipelago: Gods of Fire is looming), my head was still buzzing with all of the discussion. I couldn’t help myself, but I checked all of the various threads again. This, of course, only increased the headbuzz. I got my writing done this morning, eventually, but it was a real struggle. I have learned an important lesson. While it is certainly fun to watch my blog numbers scroll up, it isn’t worth making that a goal. It isn’t fun to try to keep up with a conversation that is moving at the speed of the internet, and breaking into all kinds of sub-conversations. More importantly, it isn’t fun to have your head filled with endless chatter, even on a topic you find interesting. So, it is time for me to withdraw from the conversation. Many thanks for everyone who posted here on the blog. This part I enjoy. One little conversation that I can follow and control. My own little corner of the internet, with a select group of people who actually come here because we share perspectives and interests, even if we don't always agree on every point. Tomorrow - back to figure painting! Is Wargaming Getting Too Easy? Over the weekend, I came across this interesting article on The Times website. In a nut-shell, it talks about how 'convenience' is shaping our world, our lives, and potentially stripping us of something important. Near the end of the article, it talks about how we've had to turn to our hobbies to find challenge and express our individuality. Read and decipher the rules yourself (or find someone to teach you). Write out all of the important information about your army/warband on a piece of paper. Roll dice, refer to charts, and occasionally perform simple feats of mathematics. 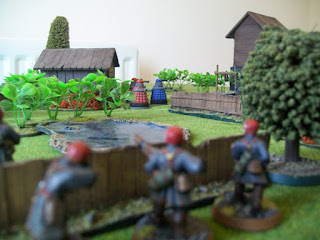 Now, many of us who wargame still do many, perhaps even all of these things, but you don't have to. Just for the sake of example, let's look at the mega-popular X-Wing game from Fantasy Flight. If you bought the game today, you could watch numerous 'how-to-play' videos online to learn the rules. The figures come painted (much better than most of us can paint) so you don't have to worry about that. The game doesn't need any terrain, but if you want there are a few ready made things you can buy, like asteroids. All of the information you need about ships is on handy cards (and more cards, and more cards). Even the 'characters' of the game, are right their for you on the cards. The game has plenty of scenarios you can play, but usually people just go for a straight shoot-'em-up. You still have to roll dice, although they are special made-for-the-game dice which means you don't need any math beyond simple counting and their are no charts to refer to. This is not to berate X-Wing. I think there are a lot of positives to be said about the game. And, it is not even the 'worst' in these terms. A lot of wargames these days are taking convenience to an even greater extreme and becoming board games, so that you get everything you could ever need in one box (well, until the next expansion box makes parts of it obsolescent). 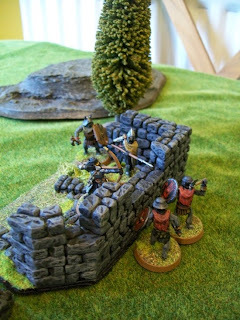 Again, I am not advocating a return to the 'good old days' of lumpy figures and children's blocks for terrain (although, I suspect there is just as much fun to be had that way). I am advocating that we keep some of the difficulty in the hobby. 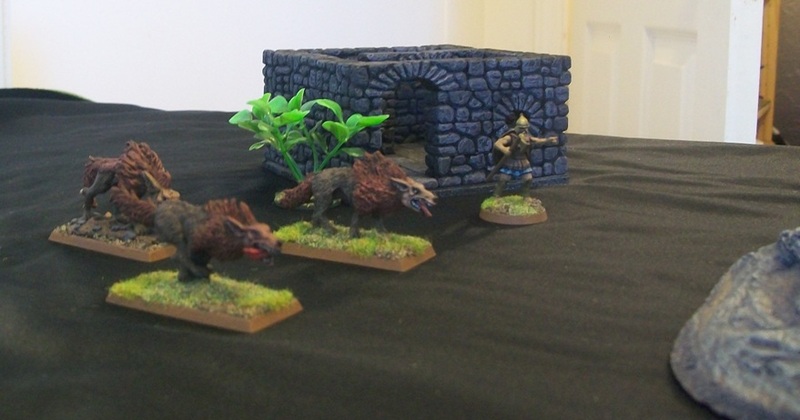 I've been painting minis for around 30 years. 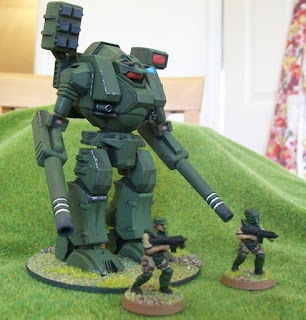 I've gotten pretty good at it, and now it is one of the great, meditative pleasures of my life; but would I have ever started if I could have bought really nice looking pre-paints? I used to make a lot of scenery. I was pretty good at it, but for the last 10 years I have bought most of my scenery pre-made. I love using paper and pencil during wargames. Seriously, I take real joy in using a sharp pencil to make notes, and have developed good handwriting partially because of this. It's probably one reason I wrote a wargame where every figure has lots of Health that is slowly degraded through a game (a very un-modern wargaming element) - more excuse to use my pencil. I know, for some people, all they want to do is play the game, and the rest is just an annoying distraction. It's your hobby, do what you want. However, if you don't try some of these things, if you don't invest the time it takes to work on them and develop the skills, you will never know if there might be more enjoyment to be gleaned. Start small. Buy a few figs. Paint them. Come up with their story. Design a scenario that is specific to your figures. Write it all down. Build a small piece of terrain that features in that story. Then play the game. Afterwards, write about it. Blog about it. Decide what happens next in the story and see if you need new figures or new terrain. Let it spiral upwards and onwards out of control. To me, that is the joy of the hobby. But even for me, it is often easy to forget all of this...for the sake of convenience. As a final point, I am not saying we must all enjoy or even participate in all aspects of the hobby. If you don't like painting, that's fine. What I am saying is that we should take our time to find the parts we love, and when we do, invest in them. I believe today's market place makes it easy to forget this. Note to self: make some terrain. My Ghost Archipelago crew is slowly taking shape. This is another figure from the female crew pack sculpted by Mr. Bobby Jackson. Having got a brush on a few of these figures, I can honestly say this is one of my favourite packs in the range. 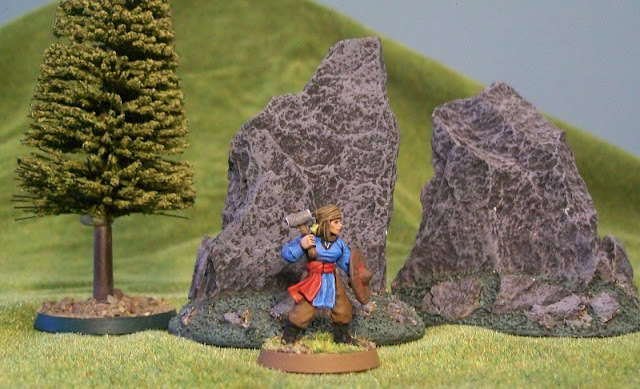 Simple but beautiful sculpts and just a delight to paint. I thought the figure would look better with a shield, but I wanted something a little low-tech looking, something light that would fit well in the setting, so I used a plastic shield from the Perry's Sudanese kit. I think it fits right in. Painting was pretty straight forward. The only oddity, I actually painted the hammer head grey with a grey highlight - as close as I've ever come to painting anything with the non-metallic metal technique. There was a time when I was a book hoarder. My shelves were crammed with every paperback I had ever read, regardless of the quality of the work. This all changed when I immigrated. Most of the books I owned weren't worth the trouble of transporting across an ocean. This gave me a different perspective on my book shelf. Today, I only keep books that I really believe I will read again or are important reference works. 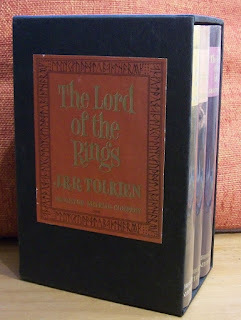 In fact, of my entire book collection, there was only one work which I knew from the beginning would definitely be coming with me: The Lord of the Rings. If you are reading this blog, I'm sure I don't need to go into why this work is important to me. Not only did I always want to keep this trilogy with me, I wanted to keep my specific copy. It's not rare, or valuable, but it is rather nice. I bought it about twenty years ago when I was working in a rare and second-hand bookshop in Chapel Hill, NC. Although it has been carefully erased, if I look very closely, I can just see where the $30 price was written. While I'm sure I got my employee discount on that, it was still a descent chunk of money at a time when I was eating spaghetti every night (literarlly) and couldn't afford to replace my shoes. It's good to think that even then I had my priorities right! There are a couple of interesting things about this collection. The books state that they are part of the 10th printing of the 1965 US edition, except for The Return of the King which claims to be part of the 9th printing. I'm not sure if this is because this book is original from a different set or just an oddity because this book was published later than the other two. Also, on the dust jackets of all three books it says 'Revised Edition', but on the inside it says 'Second Edition'. All three books feature dust jackets similar to the front of the slipcase, and the tops of the pages of each is stained with a colour to match the dust jacket. My dust jackets are protected with clear acetate which I obtained from the store where I was working. All three volumes feature pasted in maps (mostly black and white, though with spot red). 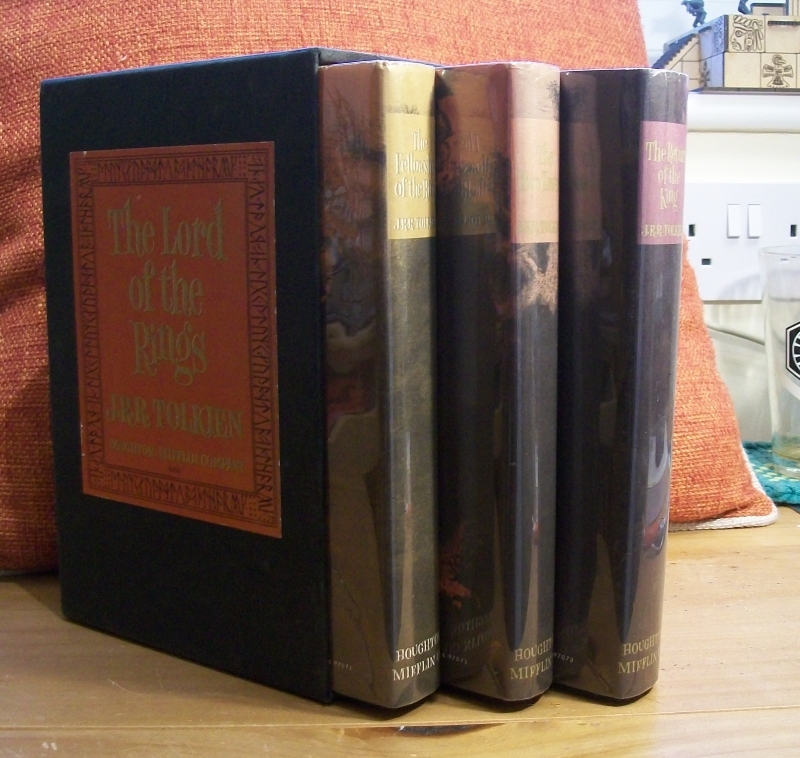 The first two volumes contain the classic 'Middle-Earth map', while the third features a blow up of the region around Gondor and Mordor. 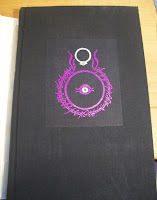 Under the dust jackets, each volume has a very attractive cloth cover featuring the Eye of Sauron and a ring - although, oddly, the ring has some kind of decoration or gemstone. This little design is also featured in small on the back of each dust jacket. My father owns a similar collection of the trilogy, although his are displayed in the cloth as the dust jackets decayed after too many readings to his children (thanks, Dad!). Should I ever move countries again, I feel sure that these books will accompany me still. I am operating a new system for painting miniatures these days. I start off by going to the lead pile and picking out 3 to 5 models that I’d like to paint right now. I prep and prime them as a unit, and then paint them one by one, not even thinking about any others until I am finished. So far, this new system has a made a huge difference to my enjoyment and productivity. I am no longer weighed down by a mass of unpainted minis on my table, nor am I likely to get bored of the particular miniatures I am painting before finishing. 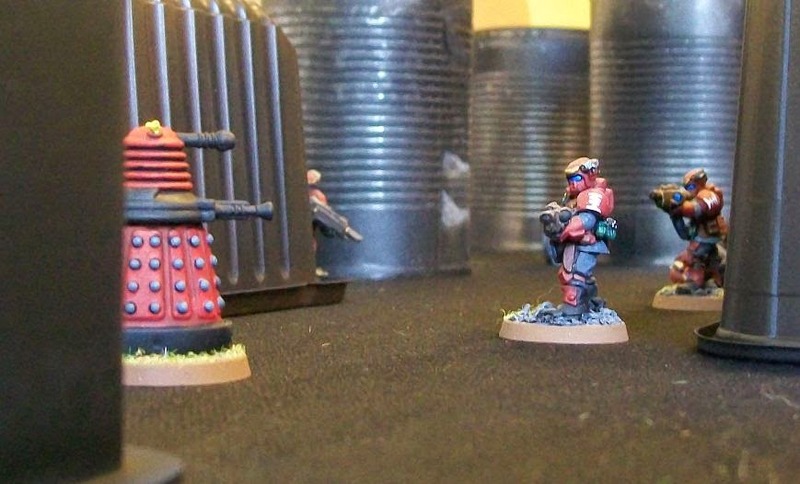 Especially since the minis chosen often have nothing to do with one another. For example, in the latest batch, I pulled out this guy. 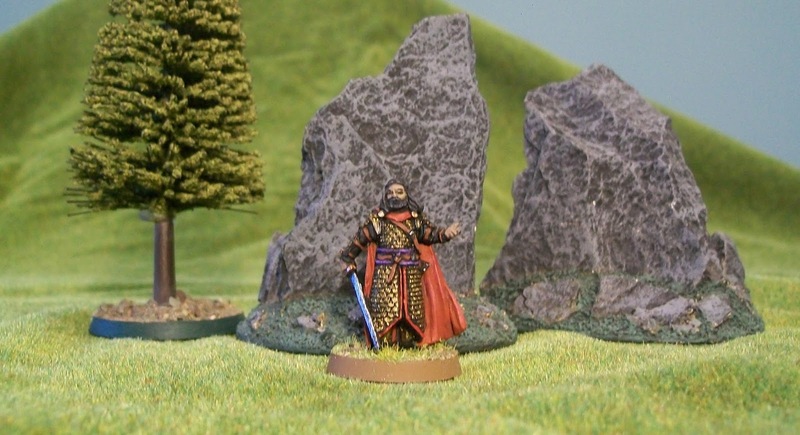 It’s a GW The Lord of the Rings miniature depicting Háma, Captain of the Guard of King Theoden of Rohan. However, I already have a by-the-book painted miniature of Háma in my collection, one that is in a more combat-ready stance. Not really needing a second, I decided to paint him as a different character. Looking around for inspiration, I latched onto the colours used by GW for their Easterlings. The red and gold makes quite an attractive combination. So, I tried it out. I also gave the figure dark hair and a darker complexion to take it farther away from its Rohan origins. I’m pretty happy with the results. It wasn’t a hard figure to paint, but it’s a beautiful sculpt. Since I have brought up the character of Háma, and am unlikely to ever do so again, let me just say, that this is one of the few areas where I was disappointed by Peter Jackson’s LOTR trilogy. Háma is a very minor character really, but he is well played by John Leigh. His knowing decision to ignore Grima’s order to ‘take the wizard’s staff’ and to not interfere with Gandalf in Edoras, goes a long way to saving his king. In the books, Háma is killed while fighting at Helm’s Deep. In the movie, he is killed in a rather brutal and dismissive fashion by a warg-rider on the journey to Helm’s Deep. To me this was a missed opportunity. His death accomplishes nothing in the movie. It’s never even remarked upon. Instead, if he had died at Helm’s Deep, this could have been used to illustrate the sacrifice of the Rohirrim at that battle – and frankly, would have probably produced a more moving death scene than the one of Haldir, who wasn’t an overly relatable character. Just to confuse matters in the movie, we do encounter Hama’s son Haleth before the battle of Helm’s Deep. This does give a nice moment of humanity to Aragorn, but it is kind of left hanging, since we never learn Haleth’s fate at the battle. ‘In a grave alone under the shadow of the Hornburg lay Háma, captain of the King’s guard. He fell before the gate. 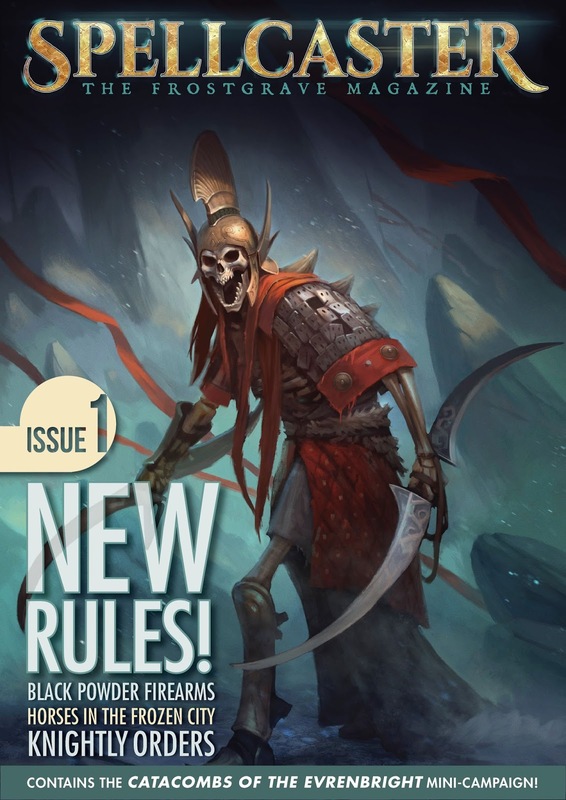 For the first two-issues of Spellcaster: The Frostgrave Magazine, I wrote most of the content myself. While this has been fun, it has always been my intention to invite others to participate in its creation. While I have started that process with a few targeted invitations for Issue 3, I am not quite ready to open it up to general submissions. That said, I wanted to give everyone who loves Frostgrave a chance to participate and an excuse to get their creative wizard hats on. 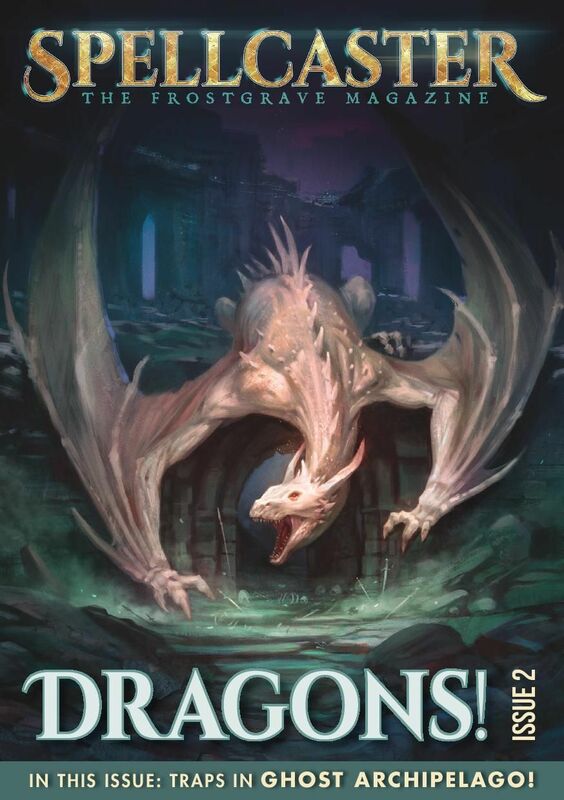 So, I am announcing the first ever Spellcaster Contest! 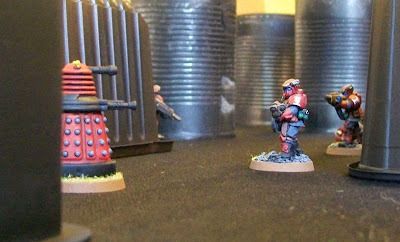 A couple of years ago, I wrote an article for Wargames: Soldiers & Strategy which was essentially a collection of unique magical treasures, presented in the form of the auction. Well, I think it is time for a new auction, and I would like to invite everyone to submit one item for the auction. I will choose my 3 or 4 favourites to include in the issue, and everyone whose item is chosen will get a free PDF copy of the magazine. Submissions should be no longer than 250 words, and must contain both a narrative section and rules section. 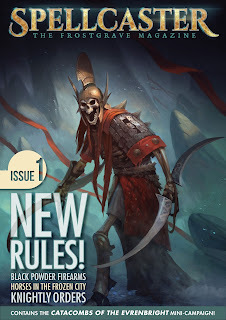 Submissions should be sent to frostgraveowg@gmail.com. The contest is open now and will run to the end of February, when I will choose the winners. Good luck, and I look forward to seeing what everyone comes up with!